The competition is not sponsored, managed or associated in any way with the Instagram. Contestants agree that they provide their personal data to the Organiser of the competition and not to the Instagram. The competition is open to Instagram users who reach 16 years of age by the time of the competition. 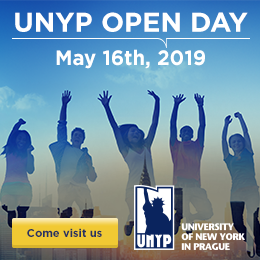 Take a picture with UNYP booth during education fairs in Bratislava (9.-11.10), Brno Gaudeamus (23.-26.10.) and Prague Gaudeamus (22.-24.1.2019). Share your picture on Instagram with #UNYP and hashtag the name of city, where you took this picture. If there will be more people on one picture, everyone can share a picture on their Instagram for a chance to win. We will draw 2 winners of Beats Studio3 Wireless from pictures from all cities. Winner shall be selected from among contestants by the method described hereinbefore. Winner shall be announced under the Competition entry and invited to contact the page by means of a private message. Should a winning contestant fail to claim the prize within 7 calendar days, the prize shall be retained by the Organiser. The winner has to collect his prize at the University of New York in Prague. The winner shall be notified about the exact method of delivery of the prize by means of a private message. The prize cannot be exchanged for cash or another prize than determined by the Organiser. The winner has no legal title to the prize and cannot claim it in court. In the event of reasonable suspicion of fraud, the Organiser reserves the right to temporarily halt or terminate the competition, amend these terms and conditions, declare invalidity of notifications sent to winners, or, without prior notice, to bar access to the competition to contestants who compete contrary to accepted ethical principles. The Organiser shall not be held liable for the contestant providing a wrong delivery address. The Organiser shall not be held liable for other reasons why the winner may not have received the prize, unless such reasons lie on the part of the Organiser. Should the winner fail to collect the price in due course from the post office, the prize shall be returned to the Organiser to retain. Should the Organiser have a reasonable suspicion of fraudulent or unfair conduct of a contestant or a person that helped or may have helped a contestant to win, or should such conduct occur, the contestant concerned shall be excluded from the competition; this applies accordingly to other conduct of a contestant or a person that helped or may have helped a contestant to win that is contrary to the competition rules or accepted ethical principles. Inclusion in the competition cannot be claimed in court. The Organiser reserves the right to amend the terms and conditions of the competition any time including during its course without prior notice. By entering the competition, the contestant accepts the Rules and expresses a consent for the Organiser to use, in compliance with Section 12 of the Act No. 40/1964 Coll., the Civil Code, as amended (hereinafter referred to as the “Civil Code”), the name, surname and city of the contestant in media (including the Internet), and in promotional and advertising materials of the Organisers in association with the competition free of charge, and to make audio and visual recordings of the contestant over a period of 5 years from the end of the competition. In compliance with the Act No. 101/2000 Coll., on the protection of personal data, as amended (hereinafter referred to as the “Personal Data Protection Act”), the contestant grants a consent to the Organiser as the controller with the inclusion of the respective contestant’s personal data to be found on his or her Instagram profile and/or of data provided by the contestant to the Organiser in the course of the competition including first name, surname, address of permanent residence in the Czech Republic, phone number and e-mail address (hereinafter referred to as “Personal Data”) in a database maintained by the Organiser and with subsequent processing of the Personal Data by a processor for the purpose of evaluating the competition, for the purpose of announcing the results of the competition, for marketing and PR purposes of the Organiser, i.e. offering of products and services, including distribution of information about upcoming events, products and other activities, including delivery of commercial communications by electronic means pursuant to the Act No. 480/2004 Coll., and for the purpose of proving the consent with processing of personal data for the purposes listed hereinbefore, for an indefinite period of time, with the option to append other data to the collected data. The contestant understands that he or she has rights under Section 11 and 21 of the Personal Data Protection Act, namely the right to provide the personal data at free will, the right to revoke the consent any time free of charge by a notice delivered to the Organiser’s address provided hereinbefore, the right to access the personal data, and the right to correct the personal data, block access to incorrect data, their destruction, etc. The Organiser will process the personal data in an electronic form and guarantee their security. In the event of doubt about legal conformity of the Organiser’s conduct, a contestant may petition the Organiser, or address his or her concern directly to the Office for the Protection of Personal Data, with its principal office at Pplk. Sochora 27, Prague 7, 170 00.